Are people ready for human-made organs? Dr. Harald C. Ott, who has focused on whole organ regeneration at MGH’s Center for Regenerative Medicine, spoke at Tuesday’s presentation. What if instead of waiting for a heart transplant, your doctor told you he or she would build you a new one from scratch? That might sound like science fiction, but it’s closer to reality than you might think. Their wide-ranging conversation bounced from the bioethics of organs made by human beings, to how self-driving cars — and the fewer traffic fatalities they promise — might affect the organ donor pipeline. The participants included Dr. Kevin “Kit” Parker, who has been working on tissue engineering at Harvard’s John A. Paulson School of Engineering and Applied Sciences. Joining him were Dr. Harald Ott, who has focused on whole-organ regeneration at Massachusetts General Hospital’s Center for Regenerative Medicine; Dr. George Church, a pioneer of genomic engineering and synthetic biology at Harvard and MIT; and Dr. David Kolesky, of Harvard’s Wyss Institute, who has been working on 3-D printing of vascular structures and tissues in his lab. Moderator Sharon Begley, senior science writer with the health-and-science website STAT, reminded attendees of the grim statistics that motivate researchers: In the 90 minutes allocated to the panel, nine people in the United States would be added to the national transplant waiting list of 116,000 people. During that time, one patient would die. HUBweek, now in its third year, was founded by The Boston Globe, Harvard University, Massachusetts General Hospital, and the Massachusetts Institute of Technology. Its many events, which run through Oct. 15, feature entrepreneurs, scientists, and journalists, as well as video projections, music, and live art performances. 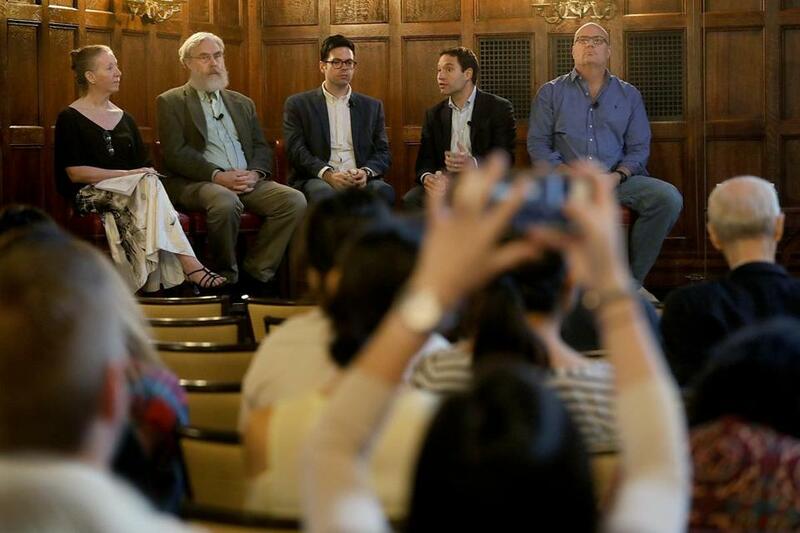 At Tuesday’s Harvard Club session, Parker said his work was inspired, in part, by his own experience. His daughter, now 9, was born with a slight heart murmur, and he’s drawn inspiration from their visits to the New England Aquarium, where he’s marveled at how a jellyfish pulses its body and a stingray flaps its wings. “The jellyfish is a muscular pump just like the heart,” he said, and the stingray’s muscles function much like those on the heart’s surface. During the last decade, Parker has worked to create muscular cell networks that can mimic the way a heart beats. Using cells from rats and jellyfish, he’s created cell structures that pulse and pump, and valves that might one day be integrated into a damaged heart or other organs, where they’ll act as scaffolds. Eventually, patients’ cells will regenerate around the implanted valves. Biology as architecture was a common theme during the session. Ott compared himself to a carpenter, and Kolesky jokingly referred to his research lab staff as a team of “really good plumbers,” with a key difference — he and his team are building the “pipes” and other vessels inside the human body using 3-D printing technology. The goal, he said, is to build vascular networks that might be used in the kidney, lung, liver, or other organs. Ott’s “carpentry” has involved creating a scaffolding of sorts. His lab strips cells from pig organs until only the collagen structure of an organ remains. He then repopulates these empty organs with human stem cells, which regenerate around the scaffold. The lab has used this technique to develop hearts, lungs, and kidneys. Ott published a paper Tuesday in the journal Nature Communications outlining his efforts to generate a small bowel, which could have implications for patients suffering from Crohn’s disease or other gastrointestinal disorders. 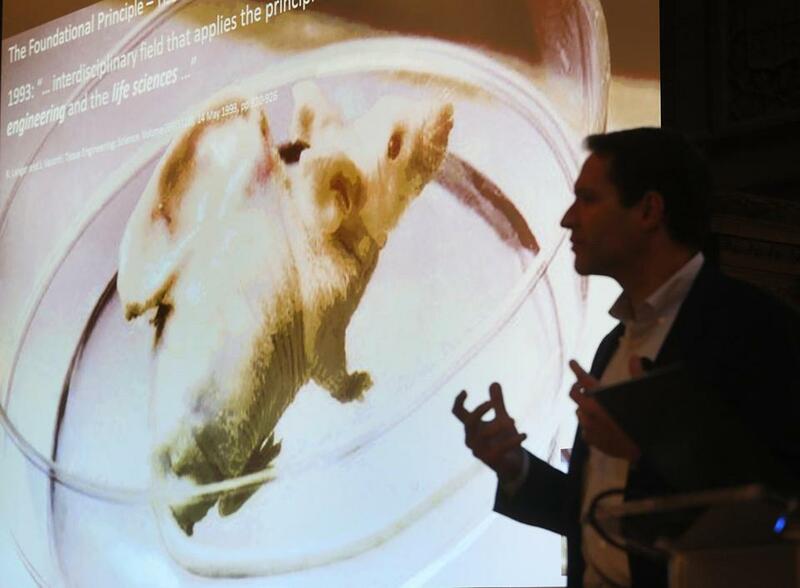 The idea is essentially “personalized organ engineering,” Ott said, but he noted that while he has successfully implanted organs created in the lab into rats, it might be a long time before they are available for humans. “If I live to see these organs make it into patients, that would be fantastic,” he said. Church, who has played a major role in expanding knowledge of the human genome, said he already is looking toward ways organs grown in a lab can be used. Using human organs in transplants, he said, relies on beating high odds. “The potential sources of organs are living and dead human beings,” he said. “This is not adequate, in that it requires nearly perfect matches of highly diverse genetics.” Church spoke of how, using CRISPR gene-editing technology that he helped develop, it is now possible to engineer the genetic makeup of cells so that they better match an organ recipient. “If you make really tiny versions of human tissues, you can make millions of tests in the labs,” Church said. One day, this gene-editing technology might also be used to create “augmented” organs that are more disease resistant, helping patients better fight off infections after they’ve received an implant. “This is not just about fixing what’s broken, but this is an opportunity for making organs that are far better,” he said. From left to right, moderator Sharon Begley, Dr. George Church, Dr. David Kolesky, Dr. Harald C. Ott, and Dr. Kevin Kit Parker attended Tuesday’s presentation.